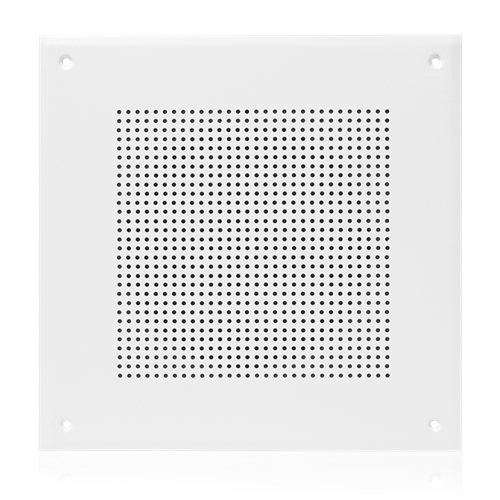 The AtlasIED IP-SA incorporates the 8" model C803A coaxial speaker and a square grille finished in white epoxy. The IP-SA is designed to be used in conjunction with an AtlasIED IP speaker, models I8X(-CK) in applications where two speakers are required but expense is a factor. There is an 8Ω speaker output terminal on the PCB in the IP speaker that can be connected to the speaker input on the IP-SA. This will provide signal and power from the IP speaker to the A8S allowing for greater sound coverage and reduced expense. The IP-SA can be used with the same surface and flush mount enclosures used by Atlas IP speakers, the SEA-I8S, SEST-I8S, and FEST-I8S.